Stadler: "We are gradually emerging from the crisis mode and are moving back into regular operation." INGOLSTADT -- Audi will dissolve the task force it set up to investigate how many of its diesel cars have "defeat" devices designed to cheat official tests of NOx emissions, CEO Rupert Stadler said. Audi set up the task force after parent Volkswagen Group admitted that up to 11 million diesel cars sold by its brands had illegal engine management software to hide high NOx emissions. Stadler believes the automaker is on the home stretch in the diesel crisis. Most of its engine variants have been reworked, he said. "We will have documented and processed all the engine/transmission combinations by the end of the first quarter 2018," Stadler told journalists at Audi's headquarters in Ingolstadt, Germany. Audi has tackled the retrofitting of up to 850,000 V-TDI engines in Europe and a few countries elsewhere. "We are at an estimated 80 percent," Stadler said. "We are gradually emerging from the crisis mode and are moving back into regular operation." Procurement chief Bernd Martens led the task force. "Early next year, we will turn the diesel issues over to the APS, our committee for product safety, as the central council," Stadler said. Audi engineers created so-called defeat devices which cut emissions in 1999, years before VW used them to cheat emissions tests, German newspaper Handelsblatt reported after the diesel crisis broke. German investigators raided Audi offices in March and prosecutors in Munich said in August that a criminal probe into diesel manipulation at Audi has now reached the management board level. 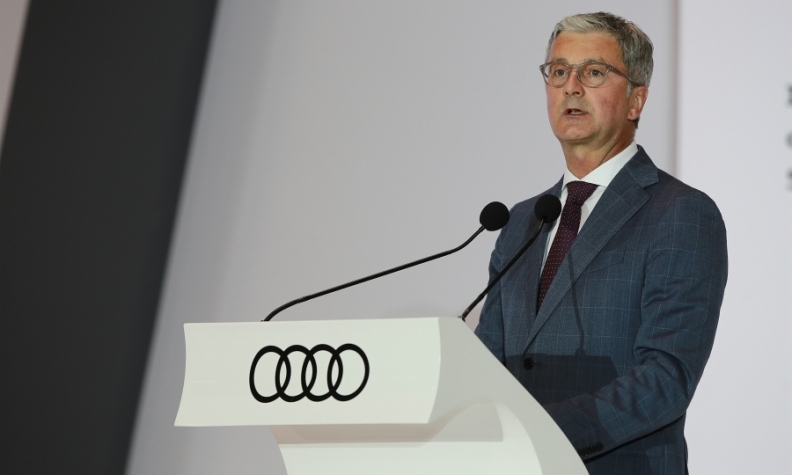 U.S. authorities are seeking to extradite former Audi manager Giovanni Pamio who was arrested in Germany in July in connection with the diesel investigation. VW Group's former top engineer, Wolfgang Hatz, has been arrested by German prosecutors in connection with the scandal. Hatz was Audi's head engine developer from 2001 until 2007. Audi is shifting its focus to alternative powertrains. By 2025, it plans to have more than 20 partly or fully electrified vehicles in its lineup, with sales of such vehicles accounting for a third of its deliveries. More than 10 of the over 20 models will be purely electric, Stadler said. Audi's first new-generation EV will be the e-tron SUV, which is due to be presented at the Audi Summit in Brussels at the end of August 2018. Audi is cooperating with Porsche on electric mobility. The first "project house" for the two brands' new premium electric cars platform has been opened in Ingolstadt. Development engineers from both brands are designing new models there. The first PPE electric cars are due to arrive in 2021. They could be a pure electric Audi Q5 and a Porsche Macan with an electric powertrain. Electrified vehicles are urgently needed in Audi's fleet to meet more stringent CO2 regulations in Europe, Stadler said. In the EU, the limits will tighten in 2020 and not meeting them can prove expensive. "Take this sample calculation," Stadler said. "Missing the fleet average target by 11 grams of CO2 per kilometer would cost us a billion euros a year in Europe. So non-fulfillment is not an option."